Coldwater Creek is a organization that manufactures women's accessories and apparel. The company belongs to the clothing industry. Headquarter of the company is in Standpoint, Idaho and they started their journey in the year 1984. Both Denies and Ann Pence, two American people established the company in June 1984. Coldwater Creek market its products through different online stores and physical stores as well. In the year 2007, the company introduced more than 300 stores both in Idaho and in other states. A record says that more than 1,200 full time employees now work in the organization. The company earns revenue of 780 million US dollars. 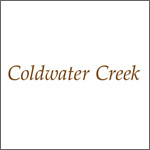 There are currently 4 consumer reviews about Coldwater Creek available. Share your review. I am very sorry to report that your store is not what it once was. I have been a loyal customer for years. Always loved your artistic, fashion forward clothing. I could always count on finding something that fit and looked sharp and beautiful. Of late, the quality of your clothing has changed for the worse. The most recent catalog (fall, 2013) has some of the ugliest items I have ever seen. I live in NYC and nobody here would be caught dead in such dowdy, ugly, clothing Wake up, please. Start serving your loyal, fashion loving customers again. What a shame taht you are no longer my fave store. Chicos, here I come! I have been a loyal customer of Cold Water Creek for many years. Imagine my surprise when I drove 40 miles to the Gilroy outlets in California, just to find that Cold Water Creek has closed its doors without any notice to its loyal customers. Your company had no problem to notify me by email about sales or sending me a catalog,- how come you closed a store without letting me know it closed or whether there is another Cold Water Creek store located nearby. It was good doing business with you while it lasted. Now I shop at Chico's. I was at the Coldwater Creek at the Forum, Store 130. The manager Denise was very rude to a customer that was trying to do a return. She treayed tbe poor lady as if she didnt have a receipt. I am a business owner and I would not treat any of my customers like that or want an employee of mines being that rude and disrespectful! Im thinking twice about shopping in Coldwater Creek again. Please take a note that you are about to post a public review about Coldwater Creek corporate office on CorporateOffice.com. This review will be public, so please do not post any of your personal information on this website. If you would like to contact the corporate offices of Coldwater Creek, please use their contact information such as their phone number, website, and address listed above to contact them. However, sometimes staff from Coldwater Creek headquarters do read the reviews on this website.